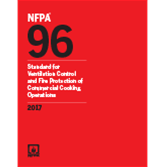 Interested in other editions of NFPA 96? Use the drop down menu above to select the edition year you need. 4.3 Field-Applied and Factory-Built Grease Duct Enclosures. 4.4 Building and Structural Duct Contact. 4.5 Duct Clearances to Enclosures. 4.7 Authority Having Jurisdiction Notification. 5.3 Exhaust Hood Assemblies with Integrated Supply Air Plenums. 5.6 Listed Ventilated Ceiling Technology. 7.8 Termination of Exhaust System. 8.1 Exhaust Fans for Commercial Cooking Operations. 8.4 Common Duct (Manifold) Systems. 10.4 Fuel and Electric Power Shutoff. 10.7 Special Design and Application. 11.2 Inspection, Testing, and Maintenance of Fire-Extinguishing Systems. 11.3 Inspection of Fire Dampers. 11.4 Inspection for Grease Buildup. 11.5 Inspection, Testing, and Maintenance of Listed Hoods Containing Mechanical, Water Spray, or Ultraviolet Devices. 11.6 Cleaning of Exhaust Systems. 13.4 Location and Application Restrictions. 13.5 Additional Fire Safety Requirements. 14.3 Hoods for Solid Fuel Cooking. 14.4 Exhaust for Solid Fuel Cooking. 14.5 Grease Removal Devices for Solid Fuel Cooking. 14.6 Air Movement for Solid Fuel Cooking. 14.7 Fire-Extinguishing Equipment for Solid Fuel Cooking. 14.8 Procedures for Inspection, Cleaning, and Maintenance for Solid Fuel Cooking. 14.9 Minimum Safety Requirements: Fuel Storage, Handling, and Ash Removal for Solid Fuel Cooking. 15.3 Airflow Switch or Transducer.